Print 56 pages per minute in black and white. Generates a maximum copy size of 8 1/2" x 14". Automatic 2-sided printing, copying and scanning saves time and money. Includes a 100-sheet multipurpose tray and two 500-sheet input trays. Built-in Ethernet port allows connection to your office network. maximum sheet size 12 3/10" x 18 1/2"
Media Size Letter - 8.50" x 11"; Legal - 8.50" x 14"; Executive - 10.50" x 7.25"; Envelope No. 10; Custom Size; 3.86" x 7.52"; 12.28" x 18.50"; 5.83" x 8.27"; 11.69" x 17"; A4 - 8.30" x 11.70"; 11" x 17"; 12" x 18"; 8.50" x 13"
Boost productivity for every workgroup. Even the biggest jobs print easily and fast, thanks to extra-large input capacity and versatile paper-handling options. Help protect your printer investments across the enterprise. Easily upgrade and add new capabilities as your needs change. Gain high efficiency for the long term. Centrally monitor and control your printers with HP Web Jetadmin. Make it easy for all to print with one common driver. This printer wakes up fast and prints your first page as quickly as 8.5 seconds. 1 Wireless direct printing is standard in the HP LaserJet Enterprise M806x+ D7P69A, and may be added as an option to the HP LaserJet Enterprise M806dn CZ244A and M806x+ CZ245A. Mobile device may require an app or driver. Wireless performance is dependent on physical environment and distance from the printer. For details, see hp.com/go/wirelessprinting. 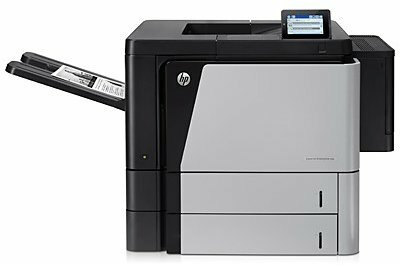 2 Touch-to-print capability is standard in the HP LaserJet Enterprise M806x+ D7P69A model, and may be added as an option to the HP LaserJet Enterprise M806dn and M806x+ CZ245A. Mobile device must support near field communications-enabled printing. 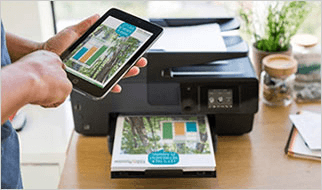 3 Local printing requires mobile device and printer to be on the same network or have a direct wireless connection to printer. Wireless performance is dependent upon physical environment and distance from access point. Wireless operations are compatible with 2.4 GHz operations only. Remote printing requires an Internet connection to an HP Web-connected printer. App or software and HP ePrint account registration may also be required. Wireless broadband use requires separately purchased service contract for mobile devices. Check with service provider for coverage and availability in your area. See hp.com/go/mobileprinting for more details.